I should have paired it with the plastic on the pâté. It's been my experience that I stand a better chance of getting a solid bottle of table wine at the $9-ish price point than below that point. I'm looking at you, Ravenswood, Bogle, Rosenblum*. There are many others, but there is only a good chance of picking a winner. It's not a guarantee. I'd been in a hurry to grab a wine for a little picnic a few weeks ago. I'd seen some mention somewhere of someone liking Cupcake's wines. It was the only thing that was in my hurried mind, apparently, because the combination of $9, Pinot noir, and California should have set off alarms wherever the heck my mind was at the time. It didn't, unfortunately, until I'd pulled the cork and taken a sip the next day. The warm California sun is great for many things, but, alas, not so much for the frail pinot noir grape. With certain pricier exceptions, Pinot noir from California tends to be overly jammy and sweet, just like the $9 bottle of Pinot Noir from Cupcake Vinyards that nearly ruined the picnic. Fortunately, there was a bottle of equally priced bordeux nearby. 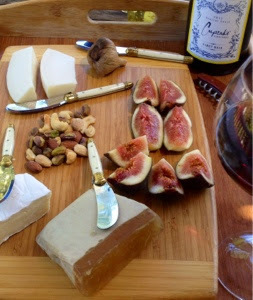 The bordeux was lovely with the figs, duck mousse pâté, mixed nuts, double cream brie, sweet black garlic, and goat Gouda we enjoyed that afternoon. I paired the rest of the Cupcake pinot with the sink drain since we weren't having beef jerky and gummy bears. Seriously. It sucked. Lesson learned. As if to make up for it, the universe recently provided Rosenblum's Vintner's Cuvee XXXV Zinfandel for $2.99 a bottle at my local Trader Joe's. Not that I'm drinking Gerard Deardieu quantities of wine, but heyhey!